Last Saturday 3rd of May, since boss wasn’t around and I have nothing to do at work, I decided to Shred some confidential papers we have in the office. We can’t just trash them and keep it in the storeroom of used papers since it’s pretty much confidential. 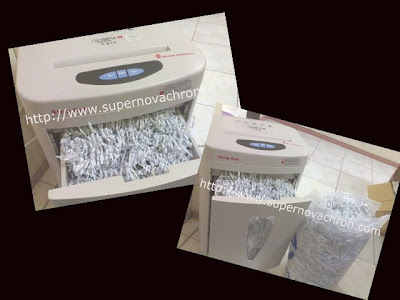 So, I did the shredding while my working student [assistant] was the one who pulled out the staple wires in it. I had fun shredding from the shredder, as if I was only playing cutting of papers. Almost done with 3 boxes full of confidential papers, as it was also past 5:30PM and time for cleaning up, finally there were only few papers left in the office for a continuation of shredding. While swiping the floor, accidentally I moved the shredder [its has rollers on it that makes it too sensitive in moving if you won’t take extra care] it fell into my right foot and whoaaaaaaaaaaaaaaaaaaaaaaaaaa!!! I was hurt, I want to kick the shredder but since I just borrowed it from the other office, I can’t do it, because I don’t what to annihilate things that is not my own. I felt an excruciating pain on my right toe, I want to shout so loud but I couldn’t as I have to show to my working that I’m tough, I seated on my chair and wanting to cry, instead I tried to bite my lips of that agony. And then, opened youtube.com, search for a funny movie clips that would help me relieved and putted my attention into what I’m watching. I got the chance to laughed, though and at least that helps a little. On our way home, I was walking imbalance for I could not fold my right toe due to the accident happened. Updating it now, I have noticed that the bruise was all over my big right toe. Poor right toe and I’m wondering that my toenail was turning violet, I hope it wont die.. huhuhu..
Hi, sis kaya mo yan malayo sa bitukaa yan he he he bitaw joke sakit baya na akoa gani pod bitaw nabagsakan sa ako anak ug bote ng Nutroplex 250 ml puno pa gyud a namatay jud ako kuku perte sakita hilak ko oy bisaan utong ko sakit jud kaayo adto pa december hangtod ron patay pa gihapon taon pa kuno ayha balik sa dati.he he he . you did not get the template link? Ok I will ask my cousin again.. because I deleted her email already.. sorry about that..
ningkamot jud ka ba lol. pwede na pang sindi ug kahoy novs! pag pahilot dayon aron maayo ka hehe. just want to thank you for your message of concern. i'm just thankful hubby wasn't harm. it's really a dangerous world now! hope your toe gets better! SIs, I am tagging you here, kakaumpisa pa lang to kaya mas maganda na jo-join ka rin.